Torque Solution Braided Fuel Line Kit for -6 Aeromotive Fuel Pressure Regulator is a perfect complement to go along with our Top Feed Fuel Rails. This kit utilizes the OEM hard lines on your Subaru and is supplied with our -6 AN quick connect fittings for a clean plug and play install. This setup is perfect for anyone looking to make up to 600 whp (proper fuel pump setup required). Our kit is designed to allow you to setup your fuel system in parallel to ensure each cylinder receives optimal fueling. All our fittings come black anodized and are compatible with all fuel types such as E85. Works with the Torque Solution Top Feed Fuel Rails or any other fuel rail that accepts -8an ORB fittings. Torque Solution Braided Fuel Line Kit for -6 Aeromotive FPR and Cobb Flex Fuel Kit is a perfect complement to go along with our Top Feed Fuel Rails. 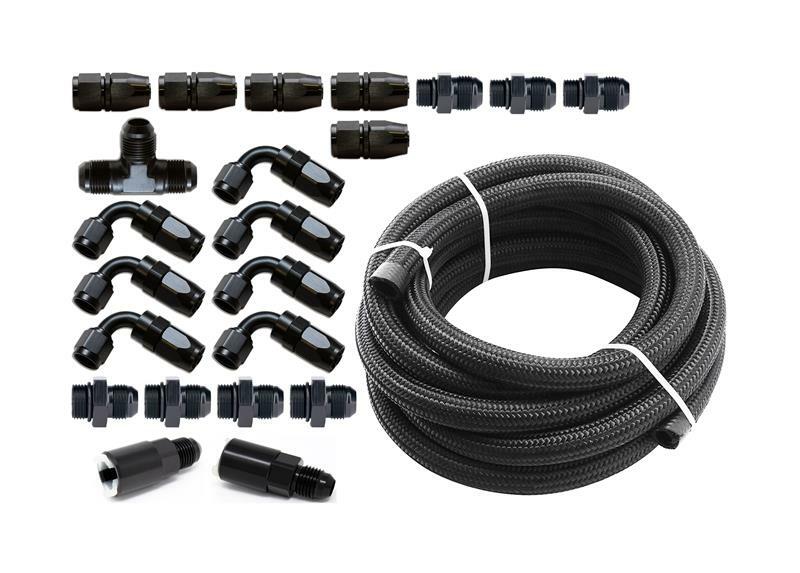 This kit utilizes the OEM hard lines on your Subaru and is supplied with our -6 AN quick connect fittings for a clean plug and play install. Also supplied with the necessary -6AN quick connect fittings to incorporate your existing Cobb Flex Fuel Kit. This setup is perfect for anyone looking to make up to 600 whp (proper fuel pump setup required). Our kit is designed to allow you to setup your fuel system in parallel to ensure each cylinder receives optimal fueling. All our fittings come black anodized and are compatible with all fuel types such as E85. Works with the Torque Solution Top Feed Fuel Rails or any other fuel rail that accepts -8an ORB fittings. **Works perfect with Aeromotive A1000 -6 Fuel Pressure Regulator (sold separately). **Converts your existing Cobb Flex Fuel Kit to quick connect fittings for a seamless install. **This kit is designed to place the Flex Fuel Sensor after the regulator in order to utilize both inputs on the Aeromotive FPR.